Umpathaw is a remote village in Meghalaya, 80 km from the capital Shillong. Nestled in the hilly terrains of the Ribhoi district, it is a tiny hamlet with around 100 households. Since independence, the village had acute shortage of drinking water. The only source of water was a natural spring and the inhabitants had to carry water every day from that spring. Not anymore. Every household of this village has access to clean drinking water today. Water from the spring is accumulated and distributed via a scientifically designed water supply system monitored by the local people. This is a part of the Holistic Rural Development Programme (HRDP), a CSR initiative of Project Parivartan of the HDFC bank. Apart from drinking water the village has seen tremendous development in sustainable livelihood and education under the HRDP. Take for example the Umpathaw Presbitarian Secondary school. It is just another small village school except that it boasts of a smart class facility that uses state of the art audio-visual materials to impart education to the students. It also has clean toilets monitored by the students. According to Mary, the young and energetic science teacher, the smart class has helped students strengthen their fundamental understanding of science. The students have one smart class session every day and it has also made them more interested in studies. The educational videos and films they watch are a clever admixture of knowledge and entertainment; a good strategy to capture the children’s imagination. The modernisation of the school and the smart class facility is also an initiative under the HRDP. Along with education and sanitation, the question of sustainable livelihood is also a very important aspect of community development. The HRDP has been actively supporting sustainable livelihood avenues. D Dkhar is a small-time farmer at Umpathaw. For last three months he has been able to increase his agricultural output and profit with the help of the vermicompost unit he has set up with the help of HRDP. It is the first step towards going completely organic. While a few like Dkhar have set up vermicompost units, some other people have set up modern piggery units in tandem with their tradition of rearing pigs. Initially they are given two pigs to rear and gradually this number is increased. Depending on the need some of the villagers have set up grocery and other stores also. Similarly paultry farming, sericulture and a lot of other activities are also taken up under HRDP. The farmers Tool Bank is another concept that is helping the poor farmers increase productivity without having to spend money on farming tools. The various equipments are available on a small amount of rent and the farmers have been hugely benefited by them. Umpathaw is not the only village where the HRDP is functioning. 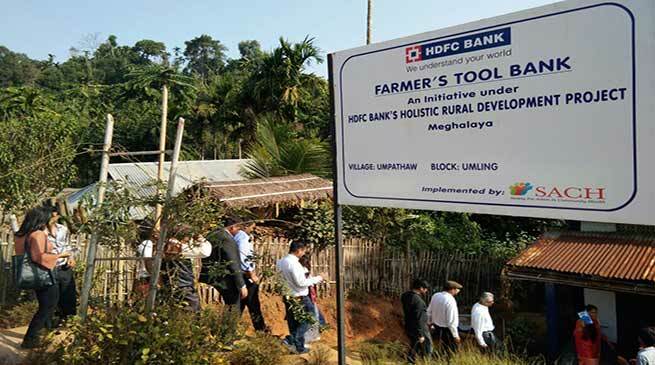 26 villages in Meghalaya and 750 villages nationwide have been covered by the Hollistic Rural Development Programme. Under HRDP, an assessment of a village is conducted to determine its developmental needs. Since every village is unique so the solutions to their problems too are unique. Keeping in mind the ground realities of the village a long term sustainable plan is devised and implemented with the help of local community and NGOs. According to Nusrat Pathan, CSR Head, HDFC, the focus of HRDP is on sustainable community development. Education; Skills Training and Livelihood Enhancement; Natural Resources Management; Water and Sanitation and Financial Literacy and Inclusion are the five core areas that the HRDP focuses on. To ensure sustainability of the HRDP projects community participation is being highly emphasised on. For example the water tanks and tool banks are monitored by a committee that consists of local people. “It is not a donor-beneficiary relationship. We believe in partnerships and therefore we emphasise on community participation. ” Says Nusrat Pathan. The local community and partner NGOs select the individuals eligible for the livelihood development schemes depending on various factors like need and relevance. For last two and a half year the HDFC bank has been running the HRDP in 750 villages in 16 states all over the country and claims to be touching the lives of 10 lakh people in those regions. It also aims to cover 1000 villages by 2019. Also it aims to spend 165 Crore rupees under CSR this fiscal.